Research conducted by: Yossef Blaer, et.al. Palmtherapy was invented by Moshe Zwang in Autumn of 1985. Palmtherapy is based on the theory that the palm of the hand represents the whole body in miniature, so that certain points on the palm correspond to particulair brain areas. Palmtherapy proposes that continuous moderative pressure on certain points of the hand can safely, quickly and effectively reduce emotional stress, like for example: anxiety, traumatic memories, sever fears, phobias, anger and grief. Palm Therapy also proposes to help to accelerate positive thoughts and behavior patterns, talents, self-esteem, motivation, mental clarity and willpower. About the difference between Palmtherapy and other alternative methods. Palmtherapy focuses on the mental emotional aspects of the individual, on problem solving and improving quality of life. While the other hand stimulation therapies focus mainly on the physical well-being and only to a lesser degree on the mental aspects of the person. Palmtherapy focuses on the visual aspects of the hands such as the lines of palms and certain mounts of the hands. While the other hand therapies focus on sensitive spots and areas of the hands that can be detected with simple pressure of the spot or with the aid of electronic acupuncture point detector. Patients at the Invasive Cardiology Unit were told that Palmtherapy is an alternative treatment method that claims effectiveness against anxiety. All heart patients were waiting for heart catheterization in the invasive cardiology unit, and all patients were screened on the existence of anxiety prior to the catheterization. 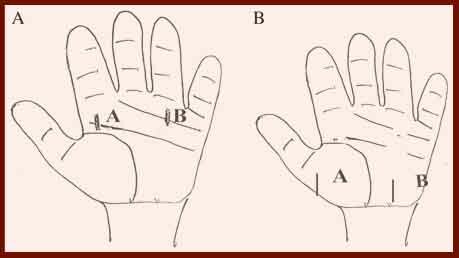 One group of the patients received Palmtherapy by steady pressure just below the treshold of discomfort at the point disignated by the Moshe Zwang (Fig. 1A) for 45 min. During this intervention the palm therapist conducted 'small talk' to distract the subject's attention, according to the Palmtherapy treatment manual. Subjects assigned to the other group received the identical treatment, except that the pressure was exerted in the wrong (pseudo) location (Fig. 1B). Figure 1: (A) Pressure points designated by Moshe Zwang. (B) Pressure points during (pseudo) therapy. The results of this research indicate that Palm Therapy was more effective compared to pseudo therapy. This was indicated by the feedback in 2 studies of 40 patients (23 + 17) AND the nurses report on 7 visual analog scales of measures of anxiety. In study 1 the patients (14 palmtherapy patients + 9 pseudo therapy patients) had similar levels of anxiety before the intervention, but after the intervention the levels were lower in those patients who received palm therapy that in those who received pseudo therapy, both by self-report and by nurses' observations. In study 2 the patients (7 palmtherapy patients + 10 pseudo therapy patients) had similar levels of anxiety before the intervention, but after the intervention the levels were lower in those who received Palmtherapy than in those who received pseudo therapy, when the outcome was self-reported anxiety. However, there was no difference after treatment when the outcome variable was the nurses observations. "The results of these studies suggest that Palmtherapy may help against anxiety before cardiac catheterization. This conclusion, however, must be tempered by the fact that the more rigorious study, i.e. in which the unblinded therapist was limited to exerting pressure on the palm, with virtually no verbal contact with the subjects, found fewer effects than the less rigorious study. The difference between the two studies we conducted leaves room to believe that at least some of the effects were due to the personalty and enthusiasm of the first author. It would be instructive to conduct another controlled study, with the pressure on the palm applied by a machine, with the location determined by an investigator familiar with the percepts of palm therapy, and all verbal contact during the procedure conducted by an investigator blind to treatment assignment.". Moshe Zwang invented Palmtherapy in 1985. In 1998 he started to teach his unique method to healthcare practitioners and healers worldwide as an additional tool for self-growth and for helping their clients. Moshe Zwang is the President of IPTA - the International Palm Therapy Association.